360° Full Parking View With Front/Rear/Rig. 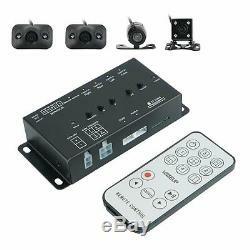 Ht/Left 4 Cameras DVR&Video Monitoring. Parking monitoring starting voltage must be greater than 12.5V (car batteries generally 13-14V), then the battery power, and a fifth DIP switch to dial up sign Parking REC. 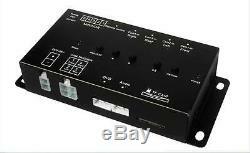 This product has a power loss protection, voltage less than 11.5V off automatically enter the sleep state. When the voltage is restored back to normal will automatically open parking video surveillance state. DVD and DVR Dual Output/Real-Time Video Recording, Parking Video Recording/TF Memory Card. Intelligent automatic recognition NTSL / PAL system and displays split screen Automatic intelligent trigger control / manual control Overcurrent and overload protection electronic fuse, automatic recovery 9-36 V wide voltage which can provide a stable 12 volts to cameras Automatically start-up , shut-off and switches dvd screen Compact housing, low power consumption, designed intelligent energy-saving less than 2 watt for driving inhabits. (1)Before using TF card format: TF card is inserted, power boot into POST mode (display automatically turns off after five seconds into standby) by remote control. Button is on, press ESC or. Stop recording (The default boot automatically start recording). Press the "MENU" button to enter the first page of the menu. Press again to switch SETUP menu page, select FORMAT. Press the left and right buttons to select EXECUTE, press "ESC or". (2)Modify the system date and time: Press the "MENU" button to enter the menu, press the switch to the SETUP menu page, select DATE INPUT again. Key to enter the interface, press the "left" or "right" key to switch to the SET. Button to enter the date and time. By switching the left and right. Press" MENU "button to confirm and switch, press REC or. Button to confirm, press the" MENU "to exit. (3) Playback: Press ESC or. To enter the Playback menu. Press the "left" or "right" button to select the video file. Press the" MENU "button to fast forward. Blue background is selected, the yellow background is not selected. Supports all N or P system camera signal inputpower on the product will automatically recognize the camera system standard. Front/Rear/Left/Right four directions around, 360 degree panoramic monitor display, complete eliminate the car visual dead in front and back. Using the most advanced split-screen technology, easily switch monitor position, arbitrary control of the vehicle to avoid the obstacle 5. Suitable for the current urban parking environment, easy to rub when parking in narrow spaces narrow spaces. It is more easier when parking in complex environment, the driver can be visually detected in the surrounding to avoid collision when parking. Video inputs 4-CH inputs Video system PAL/NTSC(automatic identification system, attention, connect the camera before power on, The equipment support hybrid system) Video parameters Resolution 640480, 25FPS, Vp-p:1.0V, impedance: 75 Video Interface 4 inputs (RCA connector), 2 outputs (RCA connector) Control mode trigger control:High Trigger/Remote control/ One key control Auto display mode Auto display Various Modes Mirror OFF/ON Operating temperature -10 to +65 Power Consumption hosts running: 2W; power-saving mode: 1W Output Power 12V / 0.8A (camera power supply) Rated voltage DC 12V/24V Best Image Quality VAG Audio Frequency1 input 1 output TF Card Memory 64G (TF card Not Included in Package) N. Size 915323mm (L W H). (1) Power Led, Power, the lights lit, whe. 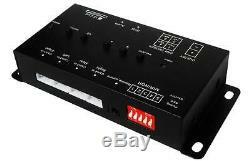 N the voltage is lower than 9v, the power light flashes; when the system. Enters standby mode, the power light flashes. This product is the normal input voltage of 12 / 24V. (2) trigger line and manual keys can select the image in any way 4-way camera. 3In Trigger state, hand the keys effectively. When you press the manual key "Quad" of or H button. The trigger is invalid, Undo "QUAD" trigger to be effective. 4 After triggering undo, image delay three seconds, and enters the standby state. (5) the trigger condition, no priority, when the trigger line when more than two trigger, then the trigger line. Corresponding channel full-screen image, only three seconds, and then jumps automatically split image screen. (6) can connect up to four cameras, and automatically split video screen. 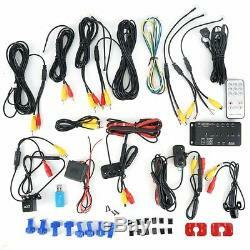 (7) car camera powered by the device for easy wiring. 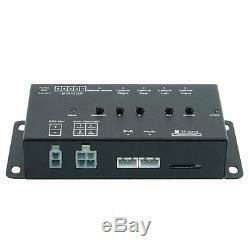 (8) DVD display device triggered by a switch, wiring and display convenience. 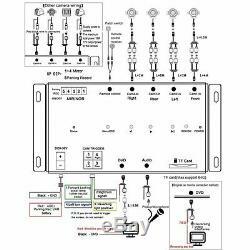 (9) Each image can be set to forward / mirroring respectively, RCA connectors can be configured to connect. Package includes: 1Video Cables 31cm×6pcs 2Display Video Cable1M 3Remote Control 4Micro SD Card Reader 5IR Receiver&SMD switch 69V-36V Power Votage 7Video control box 8Camera Trigger LINE 94×camerasFront back Leftright 10User Manul 11Guarantee Card. Handle Time: PDT 01:00 / GMT 09:00. In One Day (Excluded Sunday & Holiday). Customer Services Time (Excluded Holiday). 00:00-04:00 20:00-00:00. 00:00-01:00 17:00-00:00. Solve any problems with you in friendly way after communication. Well-Packed protects your items with suitable material so as to avoid damage during transit. ECheque will be held until cleared. The item "360° Full Parking View With Front/Rear/Right/Left 4 Cameras DVR & Video Monitor" is in sale since Tuesday, May 9, 2017. This item is in the category "eBay Motors\Parts & Accessories\Car & Truck Parts\Exterior\Mouldings & Trim". The seller is "cute_uu2010" and is located in CN.